Favcote were originally accredited to ISO 9001:2008 in 2008 having identified the need to ensure that we continually deliver an all-round quality service and have recently added: Workplace Health and Safety and Environmental management compliance to our Quality management system creating an efficient and integrated management system that encompasses and is used to manage all areas of our operations. 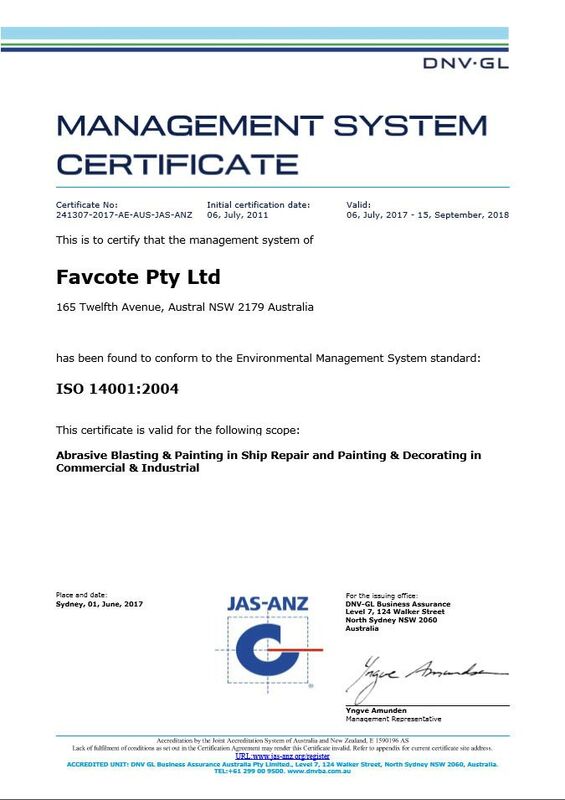 Favcote currently operates and maintains an integrated management system, certified through DNV to ISO 9001:2008 (QUALITY), AS/NZS 4801:2001 (SAFETY) and ISO 14001:2004 (ENVIRONMENT) standards which is externally audited on an annual basis a recertified every three years. 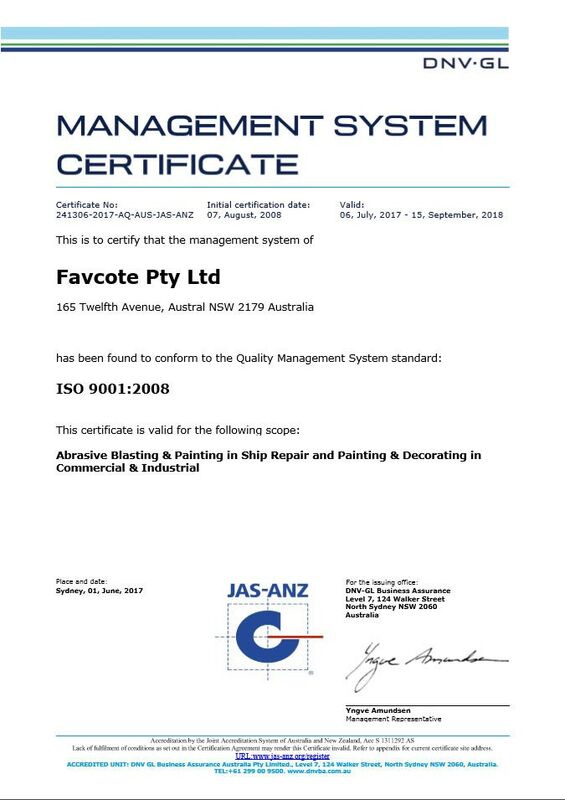 To ensure Favcote remain compliant with our external certifications and standards we schedule and conduct internal audits on a monthly basis ensuring that our integrated management system and operations are audited against all of the standard clauses at least once a year. Favcote were initially audited in July 2012 and recently in July 2013 by CSIRO verification services and have been successfully accredited with PCCP certification for subclasses 1-3 (site application) for 2 years. 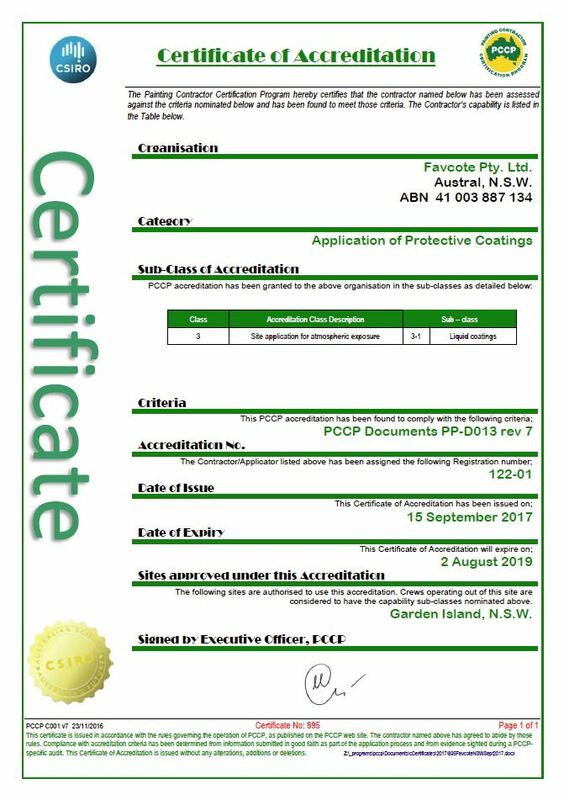 PCCP’s objective is to accredit painting contractors who demonstrate compliance with certain defined minimum performance standards – quality systems, satisfied customers, skilled and experienced personnel etc. 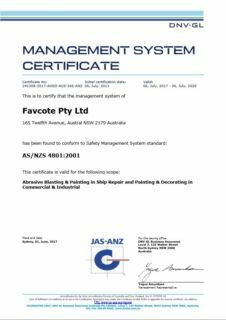 Adherence to these standards is ensured through a process of regular audits by personnel with appropriate skills, experience and knowledge of the industry. 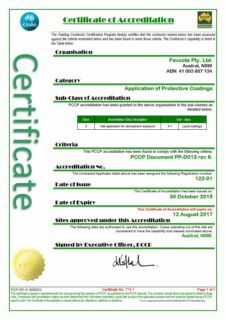 Organisations that want to make use of PCCP services apply to become Members and pay an annual subscription for the rights and privilege of PCCP Membership.